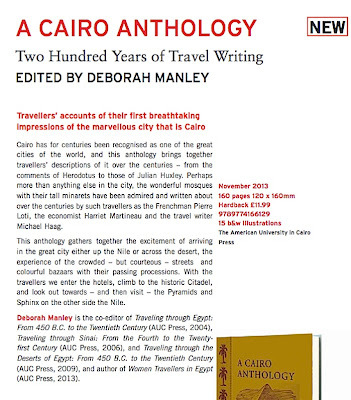 A Cairo Anthology edited by Deborah Manley has been published by The American University in Cairo Press and is available in Britain and the United States in bookshops, on Amazon and from other online retailers. 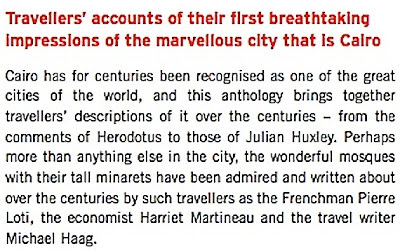 I have been included in the anthology, along with Herodotus, Julian Huxley, Harriet Martineau and Pierre Loti - which seems pretty good company to me. Michael Haag in good company. Click to enlarge the full discription of the book. 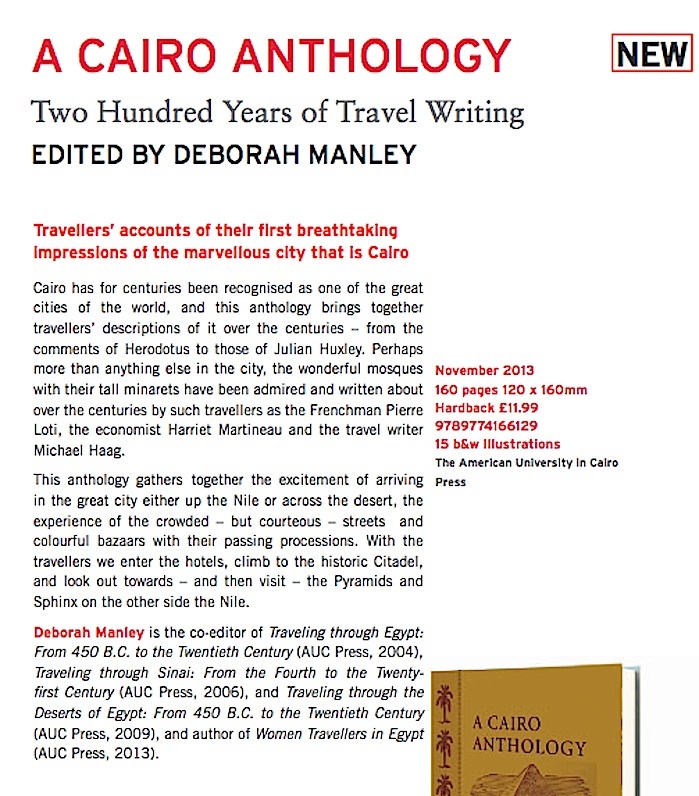 Next year The AUC Press will publish An Alexandria Anthology, edited by you will never guess whom. Protesters in Alexandria demanding protection for the city's heritage. The campaign to save the Villa Ambron, home to Lawrence Durrell in Alexandria during the Second World War, is not an isolated one. Egypt's heritage, both recent and ancient, is under threat from many directions, including uncontrolled development, the looting that takes place because of political instability, and from damage to the environment. 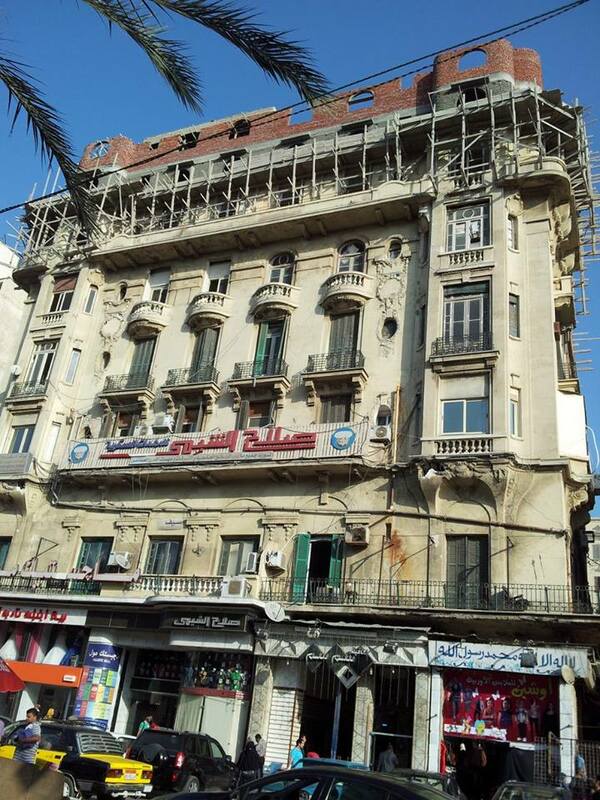 The efforts of Zahraa Awad have been mentioned elsewhere in this blog; she has also drawn my attention to The Walls of Alex; though in Arabic only, it speaks eloquently through its images of the vandalism done to Alexandria by developers and others. The Walls of Alex website is run by Dr Mohamed Adel Dessuki who is also the founder of the Save Alexandria campaign which has taken its message to the streets as the photographs in this post illustrate. The Walls of Alex website banner. Another front in the campaign has been opened by Egypt Diaries, a website in English, Arabic and Russian, which tracks and publicises abuses to the country's architectural, archaeological and ecological heritage. Protesters in the streets of Alexandria. As Ibrahim Mohamed, one of the founders of Egypt Diaries, told me, 'It's really difficult but we will never give up'. The French Gardens, view towards the Eastern Harbour. The Majestic Hotel with its twin cupolas is on the right. 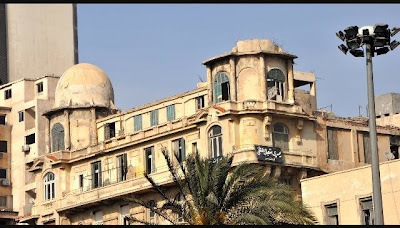 This post is occasioned by the news I have had from Zahraa Awad, who is campaigning for the preservation of Alexandria's cosmopolitan heritage (see previous post), that the cupolas of what was once the Majestic Hotel have been destroyed. The building has been taken over by a developer who is adding two storeys. This in itself is no bad thing provided he maintains the architectural integrity of the structure - and replaces the cupolas which added such a graceful touch and turned the former Majestic into an Alexandrian landmark. The building with its cupolas also has a significant literary association for it was home for a while to E M Forster who had come to the city towards the end of 1915. 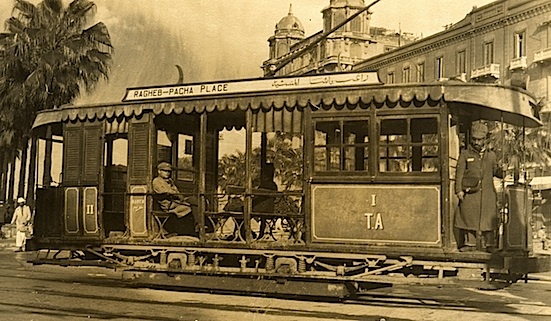 Alexandria had been a staging post for the ill-fated Gallipoli campaign. Now thousands of casualties from the disaster filled improvised hospitals throughout the city where Forster worked as a volunteer Red Cross 'searcher', questioning wounded soldiers for news of their missing comrades. 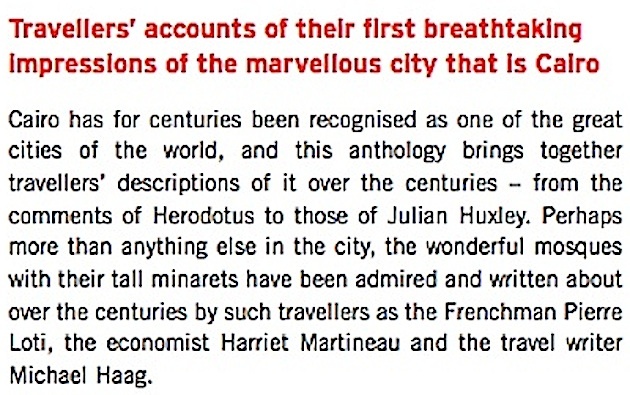 The following text is slightly adapted from my book Alexandria: City of Memory, published by Yale University Press and The American University in Cairo Press, and also published in Greek by Oceanida in Athens. Though a civilian, Forster wore the khaki uniform and bore the status of an officer and was expected to arrange his own accommodation. 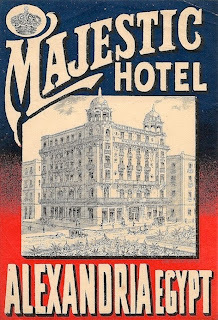 He took a room at the newly-built Majestic Hotel overlooking the French Gardens which extended north from the Place Mohammed Ali at the centre of town: 'Every modern comfort and luxury', says a guidebook of the time. The Majestic was entered from the Rue de l'Eglise Ecossaise which ran along the east side of the gardens past the Presbyterian Church of St Andrew and the French Consulate to the Eastern Harbour, while at the northeast corner of the hotel was the Rue Temple Menasce, named for its synagogue built in 1873 by the financier Yaqub Levi Menasce (who, as it happens, was the great great grandfather of Claude Vincendon, Lawrence Durrell’s third wife). Soon after settling in, Forster wrote to his mother for a supply of Kolynos tooth powder, adding 'one can't dislike Alex ... because it is impossible to dislike either the sea or stones. But it consists of nothing else as far as I can gather: just a clean cosmopolitan town by some blue water'. The names of the streets have changed, and the gardens, 'a pleasant strip' in Forster's time, are now Midan Arabi, planted with a tram terminus. The hotel, no longer majestic in name or appearance, has been converted to commercial offices, its unlit rubbish-strewn entranceway the resort of idle characters in galabiyyas, and behind them a broken lift like a gibbet, permanently suspended between floors. Ascending the broad flights of worn stone steps rising through storeys of towering corridors, glassed-off lounges and voluminous rooms, it is pointless explaining your curiosity to the shrouded young secretaries wearing the hejab, that veil covering their heads, necks and shoulders, and revealing only their faces, who despite the evidence around them deny that the building could ever have been a hotel at all. Nor can they comprehend your wish to step onto a balcony for the view. A great sea change has washed over Alexandria and its populace inhabits a history disconnected from the city's past. Forster intended to remain only three months in Alexandria but in the event stayed more than three years, far longer than his pre- and post-war visits to India put together. 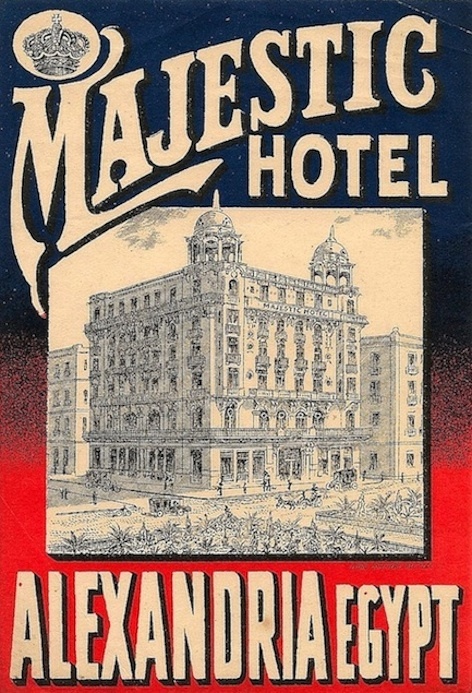 Like the ci-devant Majestic, enough survives of Forster's city that you can follow his progress through Alexandria today, though it is hardly a conventional tour. 'Tut, tut! Miss Lucy! ', he had written nearly a decade earlier in A Room with a View, 'I hope we shall soon emancipate you from Baedeker. He does but touch the surface of things'. To travel without Baedeker was not only to risk not recognising a Giotto when you saw one but to chance unfamiliar social and cultural encounters, and this in fact was the essence of Forster's idea of 'a view'. With luck, you might even meet someone disreputable, or someone you might love though you were not meant to, and these both happened to Forster in Alexandria. 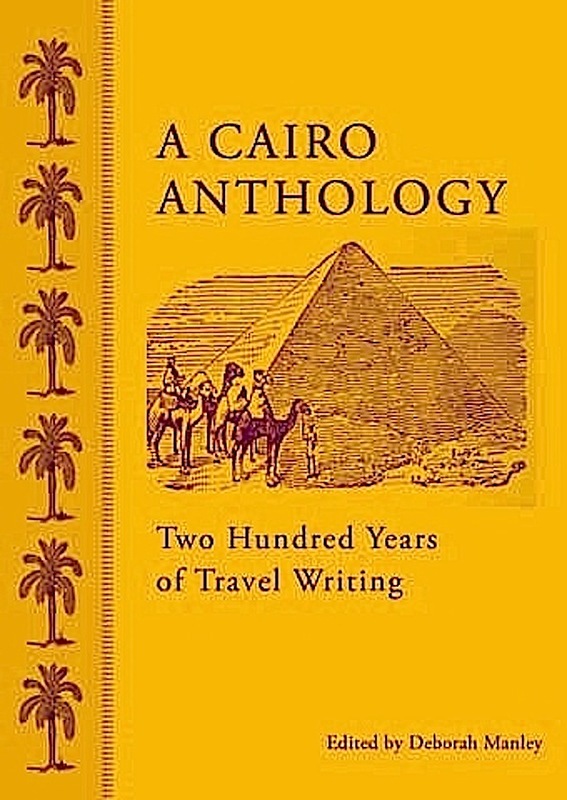 The disreputable person was the poet Constantine Cavafy and the person with whom Forster fell in love - the first and greatest love in his life - was an Egyptian tram conductor called Mohammed el Adl. 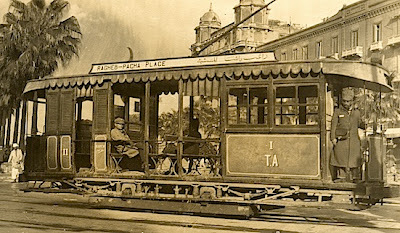 A tram turning into the French Gardens. The cupolas of the Majestic Hotel are behind. Now as the former Majestic is developed and extended upwards its cupolas have been demolished with no indication of whether they will be replaced. One cupola disappears. The low building on the left is the Menasce synagogue. The demolition was done without a permit. Photograph courtesy of Hamida Said. Further storeys are added, but no permission to build was obtained and the works have now been stopped on orders from the governor of Alexandria. Photograph courtesy of Wael Marey. 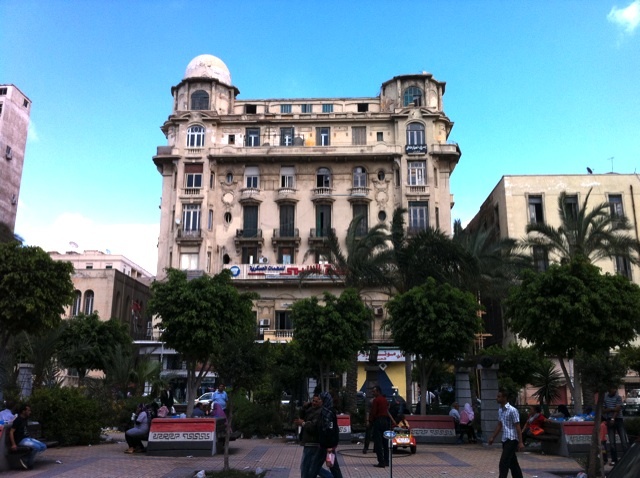 In fact work on the building has ceased on orders of the governor of Alexandria. It turns out that the developer never obtained permssion to add two storeys, or indeed to do anything at all. Ignoring niceties such as the law and permissions is not uncommon in Egypt where backhanders are common. But in this case there has been an additional factor. As Zahraa explains, 'This normal in Egypt since 2011, we didn't have government for almost 3 years'. 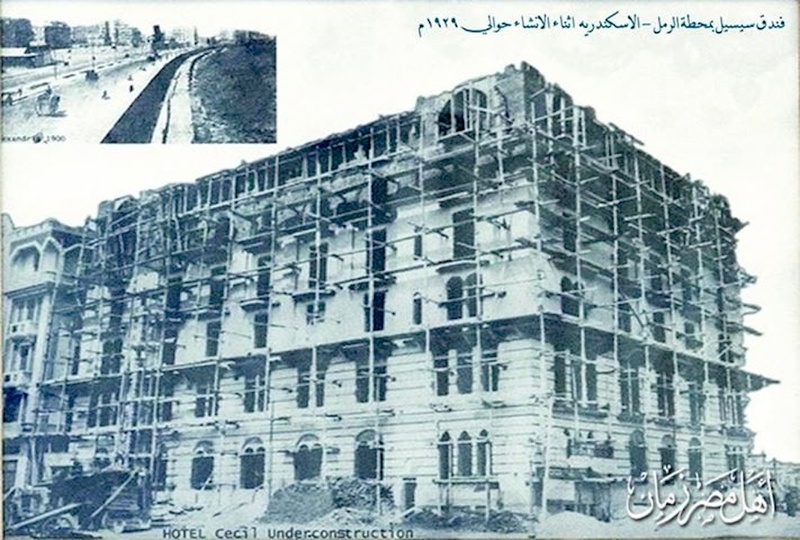 The Hotel Cecil under construction along the Corniche in 1929. 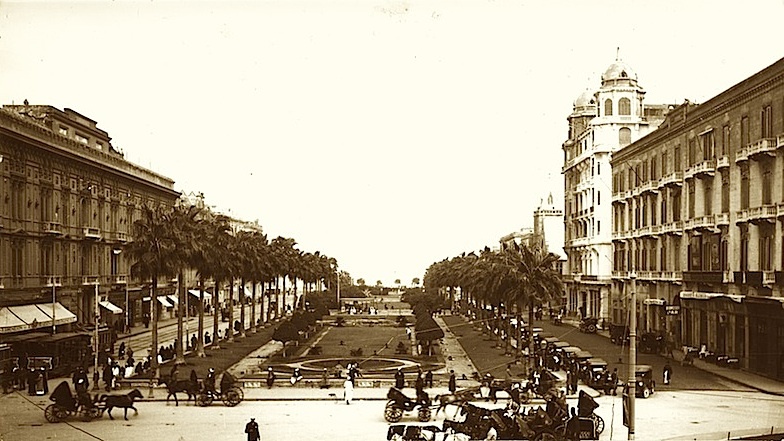 The other day I received an email from an Alexandrian called Zahraa Awad who tells me of her interest in the heritage of cosmopolitan Alexandria and her efforts to promote and preserve it. With her permission I quote from what she wrote me. I'd like to introduce myself. I am Zahraa, Alexandrian tour guide. I am the 8th generation for Alexandrian family. My roots Turkish, Greek, Jewish Moroccan, Sudanese and Egyptian of course. 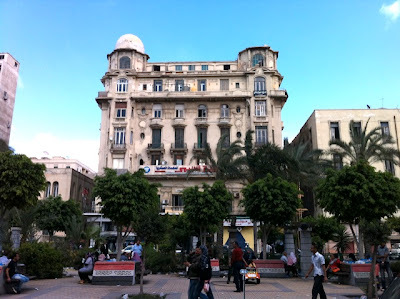 I have read your books about Alexandria and you inspired me since 2005 to start my walking tour around Alexandria. 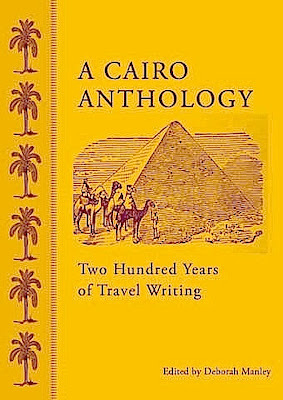 I started Lawrence Durrell's tour since 2008 inspired from your books. E. M. Forster tour and Cavafis tour. 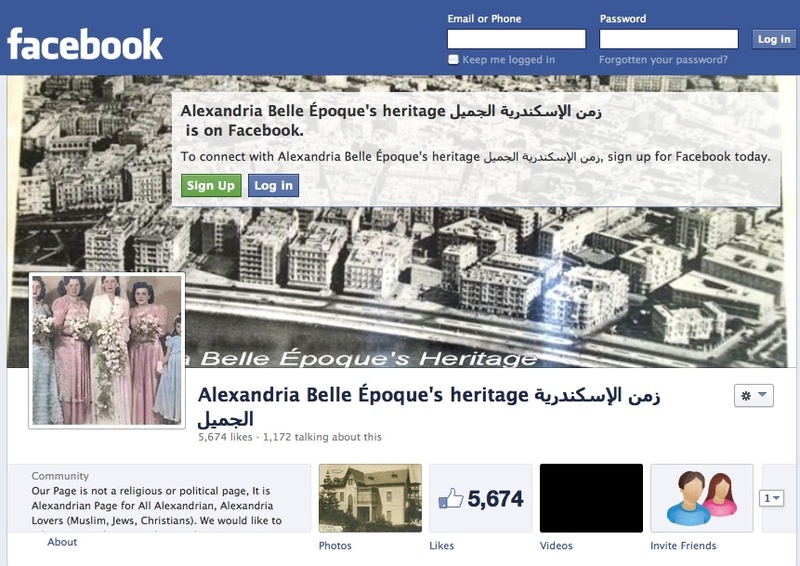 I called my tour Alexandria Belle Époque's Heritage (Nostalgia). I tried to explain how Alexandria was during 19th and 20th century. I tried to guide my tourist group around and it was working very well till 2011. But I found to solve the problem and preserve our heritage we must educate the Egyptians themselves or we will lose the rest of our heritage ... So I have started a Facebook page to introduce the city by posting old photos and tell the story in English and Arabic for all Alexandrians around the world, those who left Alexandria after Nasser time and those who are living here but they didn't know anything about the city and how it was look like, especially those immigrants who moved from the countryside. I am trying to save our heritage and I am asking your support. Please click here for Zahra's Facebook page on Alexandria where you will find many fascinating photographs of the city in its heyday, including the one at the top of this post, which I have never seen before, showing the Hotel Cecil under construction along the Corniche in 1929. I have now exchanged a few emails with Zahraa and have found that she is a mine of up to date information. To help her efforts along, I will devote some future posts to various issues she has raised. Meanwhile all power to Zahraa's enthusiasm and my wishes for her success. As she rightly says, 'to preserve our heritage we must educate the Egyptians themselves'. To read more posts on Alexandria, please click here.